One should give thought when choosing a qualified arborist. You want an arborist who will perform the work correctly and not pose a risk to the tree. 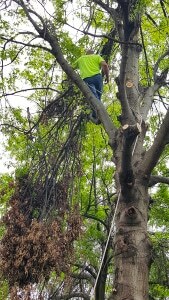 What are some things you can look for when hiring a tree care company? Most importantly, make sure the company is bonded, licensed and insured. An unqualified person may not have proper insurance, leaving the customer with a liability if something were to go wrong. Select a company that has a proven track record. Think of it as hiring a doctor for your trees. You want someone who knows what they are doing and someone who knows how to apply preventive care to your trees. Ask the company you are considering for references and then follow up on those references. Avoid arborists who recommend excessive pruning. Reputable arborists rarely recommend tree topping. More commonly, they will discuss various options to address tree conditions and situations. Get bids from more than one tree care specialist. This way you can determine which bid offers the best combination of cost, scope of work, skill, and professionalism. Don’t pay in full before the work is done. A reputable arborist will rarely ask for payment up front. Don’t allow a tree worker to climb your trees using spikes or spurs. This can cause wounds to your tree making it susceptible to insects and disease. Kelley Tree Services of Tulsa provides professional and efficient tree services in the Tulsa Metro area. 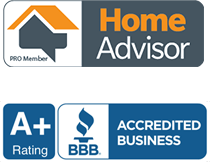 Our A+ Rating with the Better Business Bureau shows how much we love making customers happy! We are equipped with the highest grade equipment on the market today but we will never try to sell you on any service that we don’t think is absolutely necessary. And lastly, the quote we give you will be the bill you receive. You have our word on it. For more information about our tree trimming, tree removal or stump grinding services, contact Kelley Tree Services at 918-CUT-A-TREE.